The U Play Mat is more than the sum total of its parts. I was expecting something like flash cards in a convenient display case. But it turned out to be much more. Though it receives accolades as a toy for autistic children, there's more to it than that. As a mother of six children (Ages 12, 10, 7, 7, 4 and 9 months) it's rare we encounter a toy that all of them enjoy playing with. The U Play Mat is the first (and only) toy they ALL play with. With such a wide range in ages and such varying play styles, it's just about impossible to find one toy that would be educational for them all. But the U Play Mat exceeded my expectations. It was a natural vehicle for interactive play. Perhaps I should back up and explain. I was in my 40's when I had our last baby; consequently, I was given copious amounts of literature and warnings about the increased likelihood of autism. After our daughter was born, I watched everything she did — like a hawk. So when she began to flip her wrists a lot (similar to a pageant wave) I took her to the pediatrician. The doctor assured us that she's fine; apparently, she twists her wrists like that because she wants to. That's all. It appears I made much ado about nothing. However something good came out of all my research on autism. I discovered that the U Play Mat is a great, natural toy for children. Children can enjoy engaging in interactive play and learning with the U Play Mat. "Can you find the other pants?" He said with exaggerated inflection in his voice. "There it is! Yay! Good job, baby!" They went through all the U Dress cards and played for over 20 minutes! Then they switched to the U foods cards. In fact, we ended the play session because the pictures made Joshua realize that he was hungry and ready for lunch! This was important to us as a family. Our oldest son will be leaving for college by the time the baby is seven years old. Not a lot of time for them to create shared memories of growing up together and playing together. The next test would be to find out whether the U Play Mat would actually be a good method for the older children to play "school" with their younger siblings. And they discovered a way to make the U Play Mat challenging enough for them. They study foreign languages in school, and the U play provided an opportunity for them to show off and expand their budding bilingualism. "Mom, how do you say 'bananas' in Spanish?" 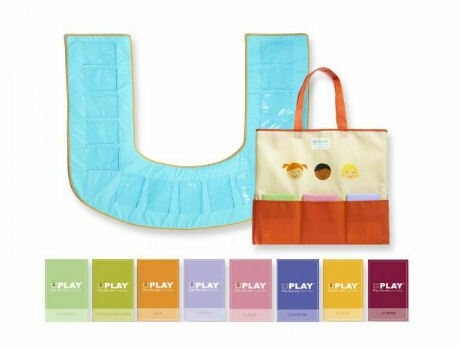 The U play mat is a wonderful, educational toy suited for a wide variety of children of different ages and abilities. It facilitates interactive play, it's fun and can be particularly beneficial in facilitating speech for children who are still learning.